San Mateo ( ; Spanish for "Saint Matthew") is a city in San Mateo County, California, in the high-tech enclave of Silicon Valley in the San Francisco Bay Area. 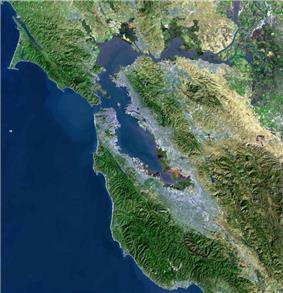 With a population of 97,207 as of the 2010 census, it is one of the larger suburbs on the San Francisco Peninsula, located between Burlingame to the north, Foster City and San Francisco Bay to the east, Belmont to the south, and Highlands-Baywood Park and Hillsborough to the west. The 2014 population was estimated to be 102,893. 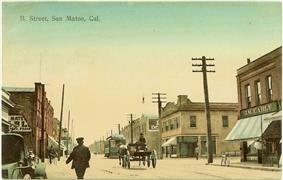 San Mateo was incorporated in 1894. 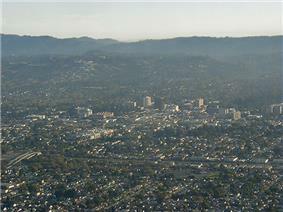 By car, San Mateo is about thirty minutes from downtown San Jose and twenty-five minutes from downtown San Francisco. Captain Fredrick W. Beechey in 1827 traveling with the hills on their right, known in that part as the Sierra del Sur, began to approach the road, which passing over a small eminence, opened out upon “a wide country of meadow land, with clusters of fine oak free from underwood… It strongly resembled a nobleman's park: herds of cattle and horses were grazing upon the rich pasture, and numerous fallow‑deer, startled at the approach of strangers, bounded off to seek protection among the hills… This spot is named San Matheo, and belongs to the mission of San Francisco.” An 1835 sketch map of the Rancho refers to the creek as arroyo de los Laureles. In the 21st century, most of the laurels are gone, removed for development. 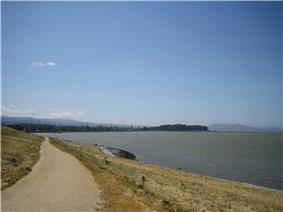 Sawyer Camp Trail, located on the western edge of San Mateo along the Crystal Springs Resavior is another popular destination for joggers, walkers and bikers. This roughly 6 mile trail begins in San Mateo and stretches north toward Hillsborough and San Bruno, parallel to the 280 freeway. San Mateo is located at (37.554286, −122.313044). According to the United States Census Bureau, the city has a total area of 15.9 square miles (41 km2), of which, 12.1 square miles (31 km2) is land and 3.8 square miles (9.8 km2) (23.63%) is water. The 2010 United States Census reported that San Mateo had a population of 97,207. The population density was 6,120.1 people per square mile (2,363.0/km²). The racial makeup of San Mateo was 56,214 (46.8%) White, 2,296 (2.4%) African American, 505 (0.5%) Native American, 18,384 (18.9%) Asian (7.9% Chinese, 4.6% Filipino, 2.2% Japanese, 1.8% Indian, 0.8% Korean, 0.3% Vietnamese, 0.2% Thai), 1,998 (2.1%) Pacific Islander (1.2% Tongan, 0.3% Fijian, 0.2% Samoan, 0.1% Hawaiian,), 12,264 (12.6%) from other races, and 5,546 (5.7%) from two or more races. Hispanic or Latino of any race were 25,815 persons (26.6%); 14.4% of San Mateo is Mexican, 2.8% Guatemalan, 2.6% Salvadoran, 1.2% Peruvian, 0.9% Nicaraguan, 0.5% Puerto Rican, 0.3% Colombian, 0.3% Chilean, 0.2% Honduran, and 0.2% Cuban. The population was spread out with 20,254 people (20.8%) under the age of 18, 6,915 people (7.1%) aged 18 to 24, 30,772 people (31.7%) aged 25 to 44, 25,286 people (26.0%) aged 45 to 64, and 13,980 people (14.4%) who were 65 years of age or older. The median age was 38.9 years. For every 100 females there were 95.4 males. For every 100 females age 18 and over, there were 92.8 males. There were 40,014 housing units at an average density of 2,519.3 per square mile (972.7/km²), of which 19,969 (52.2%) were owner-occupied, and 18,264 (47.8%) were occupied by renters. The homeowner vacancy rate was 1.5%; the rental vacancy rate was 3.7%. 50,951 people (52.4% of the population) lived in owner-occupied housing units and 44,940 people (46.2%) lived in rental housing units. In general, San Mateo's downtown core and neighborhoods east of El Camino Real are more populous and have a greater density than the neighborhoods to the west of El Camino Real where there is a lower population density. San Mateo has one of the larger, well developed, more prominent suburban downtowns in the San Francisco Bay Area. It is located roughly between Tilton and 9th Avenues and Delaware Street and El Camino Real The downtown core contains over 800 shops and restaurants, many of them in historic buildings from the late 19th and early 20th centuries. A historically influential area for the Japanese-American community, the downtown is home to many Japanese restaurants and shops. A large, modern 12 screen movie theatre complex gives the downtown a major entertainment option. 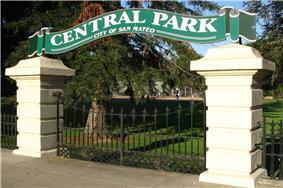 Central Park is considered to be San Mateo's signature park with tennis courts, picnic areas, playground, a baseball field, a recreation center, a miniature train, and a Japanese Tea Garden. The Caltrain station is situated downtown. The downtown also contains many large and small multi-story office buildings, apartments, government buildings and Mills Medical Center, making the area a busy employment center day and night. Hillsdale Mall is the largest mall in San Mateo County, with over 100 stores in the mall itself, surrounded by many big box stores. It has its own Caltrain station across El Camino Real. Bay Meadows was a horseracing track near Hillsdale Mall which closed down in 2008 It is currently being redeveloped into a large mixed used development which will include hundreds of new residential units, office space, retail space and acres of parks including a town square. it is scheduled for completion in 2017. it is a significant amount of new building given the city's and peninsula's limited space available for development. The economy of San Mateo would best be considered very diverse with jobs in the technology, health care, financial services, government, and retail trade fields being among the most numerous. Companies based in San Mateo include Franklin Templeton Investments, Roblox and GoPro. Residents are zoned for schools in the San Mateo Foster City School District and San Mateo Union High School District. Elementary schools comprise Preschool, K-5, Middle and Magnet schools. 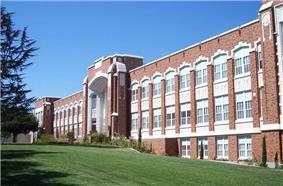 There are three public high schools: San Mateo, Aragon, and Hillsdale. There is also one private, all-male Catholic high school, Junípero Serra. There is the Carey School. The City of San Mateo operates three libraries within the city. The Main Library, the Hillsdale Library, and the Marina Library are all part of the Peninsula Library System. The Main Library located near Central Park in downtown opened in 2006 after residents passed a $30 million bond measure. Upon opening, the three story 93,000 square foot building earned numerous design awards and was LEED certified NC Gold. Windows from floor to ceiling provide abundant natural light inside. It is modeled after a retail bookstore and is technologically advanced. San Mateo maintains more than 15 parks throughout of the city. Central Park is considered to be the main one and hosts many community park functions that serve downtown residents. It has a Japanese tea garden, a rose garden, and a mini train. Beresford Park is another large park that offers bocce ball and a skate plaza. Martin Luther King Jr Park and Joinville Park offer swimming pools while Ryder Park boasts a water play structure. Parkside Aquatic Park located on the San Francisco Bay has beach swimming and volleyball. Many of these parks have picnic areas with grills, children's play areas, basketball and tennis courts, and baseball diamonds. SamTrans provides local bus service within the city of San Mateo as well as the entire county of San Mateo., AC Transit provides transbay bus service via the San Mateo Bridge to Alameda County. Caltrain provides commuter rail service on the San Francisco Peninsula between San Francisco and San Jose. Caltrain operates three stations within the city of San Mateo with the Hillsdale Station, Hayward Park Station, and the San Mateo Station in downtown. There are 41 northbound and 41 southbound trains with a stop in the city each weekday and 18 trains in both directions on weekends. Extra trains are run to accommodate extra passengers when the San Francisco Giants play. See public transportation in San Mateo County for more details. San Mateo is located near three major airports including San Francisco International Airport 7 miles to the north. Oakland International Airport, and San Jose Mineta International Airport are also within a half an hour drive. . San Carlos Airport is a general aviation airport located about 6 miles to the south. Hospitals in San Mateo include San Mateo Medical Center, an acute care facility. Cemeteries include Skylawn Memorial Park and St. John's Cemetery. The San Mateo Performing Arts Center, located on San Mateo High School, is one of the largest theatres on the peninsula outside of San Francisco. The College of San Mateo is also located here and is home to radio station KCSM. The city is also home to the Bridgepointe and Hillsdale shopping centers. Bay Meadows horse-racing track was torn down in 2008. The Japanese Tea Garden and San Mateo Arboretum in Central Park, San Mateo, CA Central Park are of interest. U.S. Route 101, Interstate 280, and State Route 92 pass through San Mateo. One of its sister cities is Toyonaka, Japan, for which the Japanese Tea Garden at Central Park was created to commemorate. Michael Moradzadeh, founder of *Rimon Law P.C..
^ "Meet the Council". San Mateo, CA. Retrieved January 21, 2015. ^ "Staff and Contact Information". San Mateo, CA. Retrieved January 21, 2015. ^ "2010 Census Gazetteer Files – Places – California". 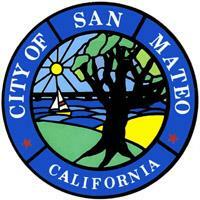 ^ "San Mateo (city) QuickFacts". ^ a b Postel, Mitchell P. (1994). San Mateo : a centennial history (1st ed.). San Francisco, Calif.: Scottwall Associates, Publishers. p. 13. ^ architecture + history llc (5 October 2012). Historical Resource Evaluation Report: 25 – 31 9th Street, San Mateo, CA (Report). City of San Mateo Community Development Department. Retrieved 23 March 2015. ^ Fredricks, Darold (25 February 2008). "San Mateo's Peninsula Hotel". San Mateo Daily Journal. Retrieved 22 March 2015. ^ Myrow, Rachel (27 January 2015). "San Mateo Rides Tech Boom But Keeps Small-Town Feel". KQED News. Retrieved 4 August 2015. ^ Widell, Cherilyn (30 July 1992). "National Register of Historic Places — Registration Form: de Sabla, Eugene J., Jr., Teahouse and Tea Garden" (PDF). United States Department of the Interior, National Park Service. Retrieved 22 March 2015. ^ Gilliam, Harold (2002). "The Four Seasons: Summer". Weather of the San Francisco Bay Region (2nd ed.). Berkeley: University of California Press. pp. 40–43. ^ "Bay Area Climatology: Peninsula Subregion". Bay Area Air Quality Management District. 4 October 2010. Retrieved 23 March 2015. ^ "2010 Census Interactive Population Search: CA - San Mateo city". U.S. Census Bureau. Retrieved July 12, 2014. ^ http://www.bayareacensus.ca.gov "Demographic Profile Bay Area Census" . ^ Official Website of the San Mateo Adult School. ^ Architecture Record | McGraw-Hill Construction. Archrecord.construction.com (2011-10-05). Retrieved on 2013-07-21. ^ Schedules. Caltrain.com (2012-09-29). Retrieved on 2013-07-21. ^ Sister Cities information obtained from the Sister Cities International, Inc. (SCI)." Retrieved on October 6, 2015. Alexander, Philip W; Hamm, Charles P (1916). History of San Mateo County from the earliest times : with a description of its resources and advantages : and the biographies of its representative men. Burlingame: Press of Burlingame Publishing. Brown, Alan K. (1975). Place Names of San Mateo County. San Mateo, Ca. : San Mateo County Historical Association. Cloud, Roy Walter (1928). History of San Mateo County, California. Chicago: S.J. Clarke. History of San Mateo County, California. San Francisco: B.F. Alley. 1883. Hynding, Alan (1982). From Frontier to Suburb: The Story of the San Mateo Peninsula. Star Publishing. Postel, Mitchell P. (1994). San Mateo: A Centennial History. San Francisco: Scottwall Associates. Ringler, Donald P (1975). San Mateo, U.S.A. : the golden years; an early background and sixty years of the city of San Mateo's history from its beginning at the Polhemus Plat in 1862 up through World War I. San Mateo: San Mateo Bicentennial Committee. Stanger, Frank Merriman (1963). South from San Francisco; San Mateo County, California, its history and heritage. San Mateo: San Mateo County Historical Association. Zompolis, Gregory N (2004). Images of America: San Mateo. Charleston, SC: Arcadia.